It was a very foggy and misty morning so we didn’t have great visibility, but we drove back around Myvatn and traveled Route 87 up to Husavik. 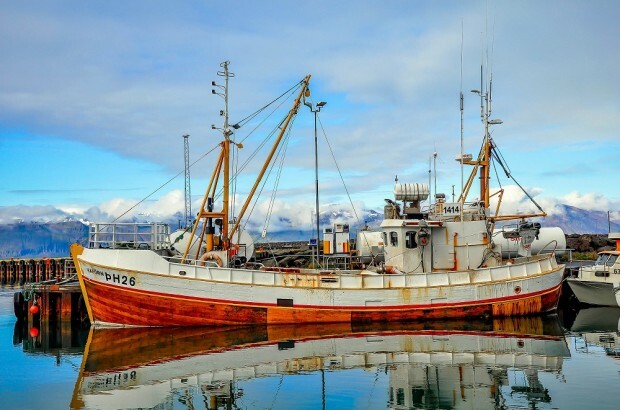 Husavik is the whale watching capital of Iceland. 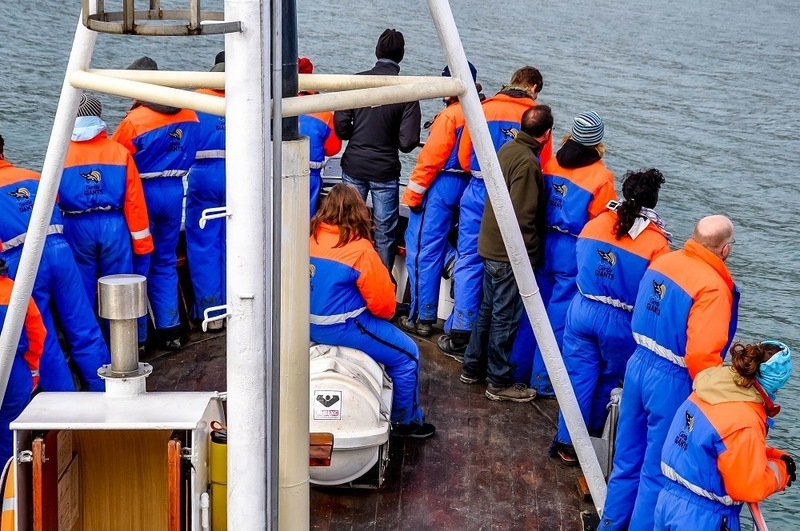 Years ago, it was a major center for whaling, but these days, the hunters bring cameras and binoculars. 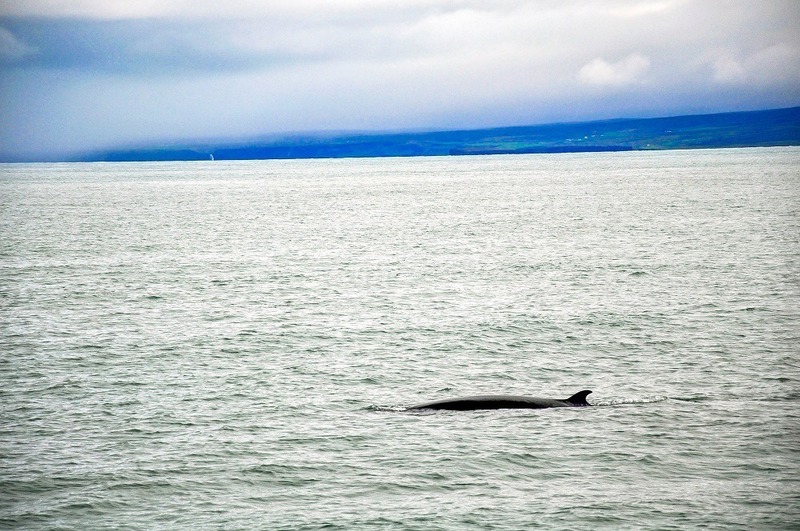 Two whale watching companies operate in Husavik — North Sailing and Gentle Giants — and both are the same price, so we picked Gentle Giants because they had the right timing. We headed out on the boat named Sylvia with our guide María and about 20 others. The company offered us bright orange and blue outfits kind of like snowsuits to protect against the cold. They were pretty darn ugly, but I’m glad we grabbed them – it was COLD. Our boat headed straight across the bay nearly to the far shore where the whales gather. 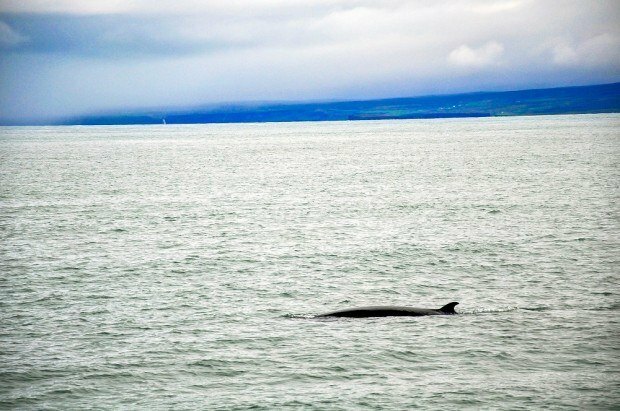 A number of different species gather in the bay, but we were fortunate to see two different Minke whales and a couple of harbour porpoises. 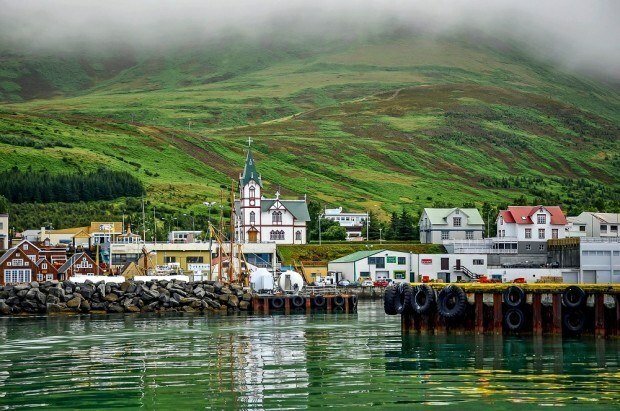 Husavik, as seen from our boat. We were disappointed that we didn’t get to see any big breaches or tail slaps, but we did get to see the whales come up for air on a number of different occasions. I really didn’t know what to expect from whale watching. I guess I expected to see more, but when you’re out on the water and that first whale comes into view, it’s a complete adrenaline rush. On the way back into Husavik, they served Icelandic pastries and hot chocolate to help warm us up (a nice touch!). From Husavik, we traveled South on Route 85 through a long, low valley of farms before backtracking to visit Godafoss, one of the most spectacular waterfalls in Iceland. 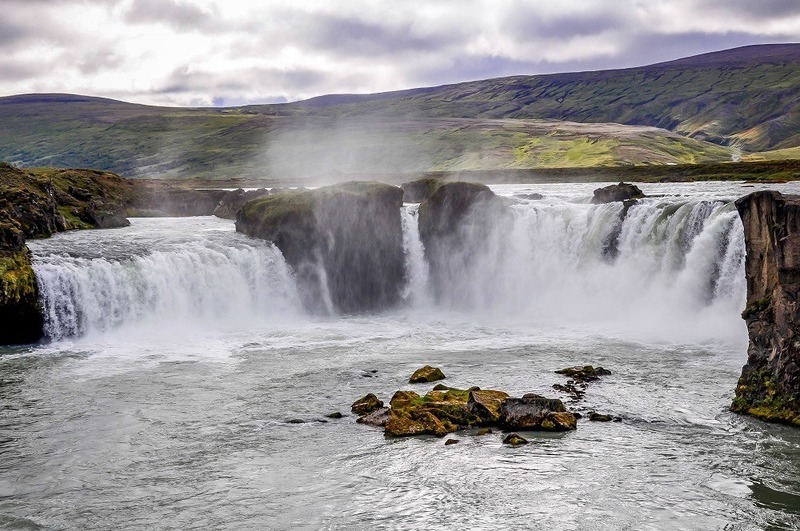 You see Godafoss from miles away – the horseshoe-shaped falls kicks off an amazing amount of mist. 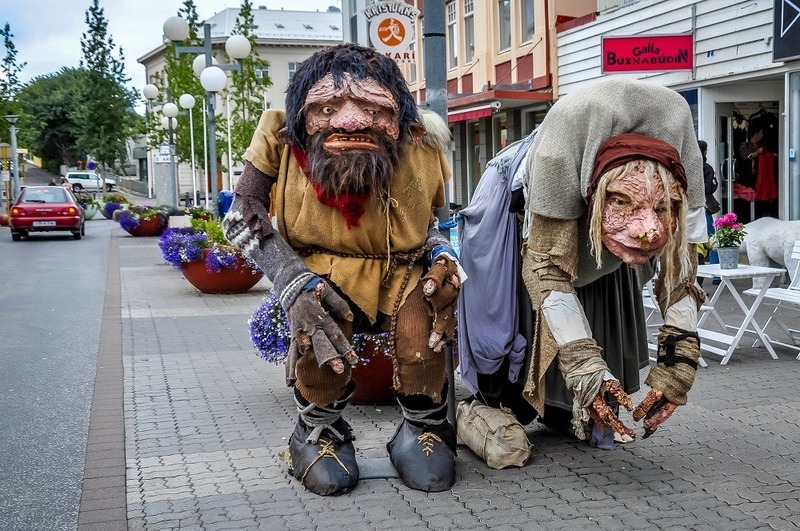 Our next destination was Akureyri, the second largest city in Iceland after Reykjavik. In Akureyri, parking is free, but you need to have a parking disc. Once we figured out to get one of the discs at a bank, we had several hours to look around. We browsed some shops and bookstores and walked down the Strandgata to the cruise ship and the new Culture House – a beautiful, impressive round building right on the harbor. 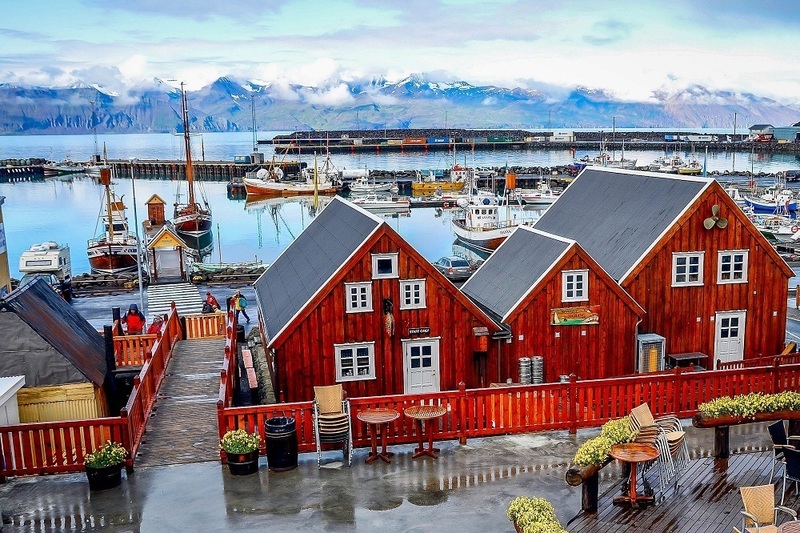 Mostly, after so many days in so many small villages, we enjoyed spending a few hours in Akureyri soaking up something that resembles a city. For dinner, we had wanted to go to the famous Fridrik V, only to learn that the restaurant had closed several months before. Instead, we opted for the newer Rub 23 Steak. The rub with Rub 23 is that you pick your meat and then you pick your dry rub and then they cook it for you. The food was excellent, but our steaks were a tad overcooked — a common theme throughout our time in Iceland. After dinner, we stopped in to Café Amour on the Radhustorg traffic circle for drinks, dessert, people watching, and Opal. I’d heard about Opal and Topaz – candy favorites of children in Iceland. They also make grown up varieties in the form of alcoholic beverages. So, I did an Opal shot. Damn. It was nasty – kind of like a jacked up version of Nyquil. After, we shared a dessert and I had a cider to clear the Opal taste out of my mouth. We stayed at another farm stay for the night – the Pétursborg in Hörgárbyggð. This place is just a stone’s throw from the city border and sits out with gorgeous views of the fjord. The family who runs the Petursborg is very nice, but the rooms are on the lower level their home meaning that you hear the family above. Since they have two young children (under the age of about 6) and a dog (without nails clipped), there is a considerable amount of noise. It is quiet during the night, but the girls and the dog wake early and it proved impossible to sleep much beyond about 6:30am, which is not ideal for vacation. The location is great and you might have better luck in one of the cabins on the premise. Basically, we’d wished we’d stayed someplace else.